Written March 2012, updated April 2015. So a friend or family member has asked you to be their doula, and you're not sure how to best help... or for new doulas preparing to attend your first birth, how can you better serve this couple? * My first thought - pray! 🙂 Whatever your religious affiliation, I find incredible strength through seeking inspiration. I pray about every couple I work with and every birth I attend - you can bet I'm praying for guidance. Birth can be fast or slow, but in either case find a moment to pause and focus both before you step into that room, and in any quiet minute while you are there. Whether through prayer or listening to your intuition, stop long enough to look around and see what you can do to help. Ideas will come! Sometimes labor is so fast that it seems you can barely keep up, but even in those situations I am seeking inspiration for how to best support the couple. Trust your intuition in these moments. * Sit down with the couple in advance of the birth if at all possible to discuss their hopes for the birth and their expectations for YOU. Do they want someone to give verbal help, hands on care, explanations for various procedures, reminders of their birth plan? Ask if they have a birth plan and review it with them, as you may need to remind them of various aspects of their plan when things are going fast. (You don't speak to the staff for the couple, but you remind the parents to speak to the staff and ask any questions they may have.) Consider attending a prenatal visit with them so you can meet their care provider in advance. If you are being hired as a doula then generally you provide 1-2 prenatal visits with clients to review this formally, but if you are providing support as a friend or family member then it's still really good to talk with BOTH parents before the birth so you're all on the same page as far as what your role will entail at the birth. From one birth to the next I find parents may envision me doing different things - find out what they want & need from you. * Become familiar with the stages of labor, comfort techniques, positions for labor, etc. If at all possible read yourself (and suggest to the couple that they read) some of these books. Or at least read the chapters I specify on that post, if you don't read the entire book. Here are some posts about helping a slow to start labor, comfort technique video, etc - getting ready for baby! Whether you've given birth yourself or not, attend a birth besides your own, whatever your experience with birth - familiarize yourself with birth! * While many hospitals have a lactation consultant on staff, they are not always available after hours and can widely vary on their helpfulness. If the mom wants to breastfeed then suggest she connect with the local La Leche League and find out about lactation consultants in her area. This is also a great resource they may want to read in advance - The Breastfeeding Book: Everything You Need to Know About Nursing Your Child from Birth Through Weaning You don't need to be a breastfeeding expert, but you can help ease her nursing journey by providing resources. When working with first time parents I often find that nursing is a HUGE concern for them, some say even more of a concern than the labor itself! You don't need to have nursed a baby yourself to provide the emotional support so many new moms need, and to help connect her with resources. * Pack a bag - you'll need a change of clothes for yourself, snacks, water bottle, change for the machine, your wallet, cell, chapstick, lotion, pen and notecard (if you want to handwrite a timeline) and a jacket or sweater. (Hospitals are cold! Even in July in Texas they are cold!) For the parents considering packing a bag-o-tricks: rice sock, peppermint or other essential oils, a mini fan, etc. You can see my full doula bag list here. You do not need all of those items - what you most need to comfort a mother are your hands and your voice. Please remember that - if you walked into a birth without any bag at all, your smile & support would still be a gift to the parents. * Relax. Your calm presence will offer reassurance and comfort, and you don't have to do everything perfectly right to be able to truly help a laboring mom. Look around and see what you can do - would she like the lights dimmed? Something to eat or drink? Does she need to use the bathroom? Help her change positions at least every 30 minutes. Would she like some music playing? Does her partner need to step out to get a drink or use the restroom? Does some pressure on her lower back help during contractions? Would a heat pack help? A cool cloth on her head? You won't be able to remember everything, and that's okay! You're working to help create a calm, peaceful birthing environment, and your smile and assurances will work wonders. Any other tips you would share for someone doula-ing for the first time?? 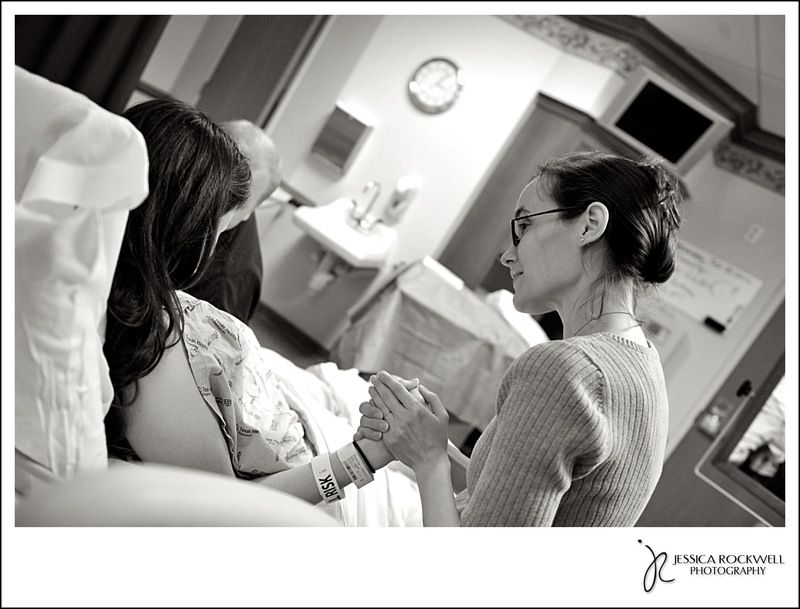 Thanks to Jessica Rockwell Photography for capturing these photos of me doula-ing and allowing me to share them! This entry was posted in Birth, Hospitals, TIPS FOR DOULAS and tagged Denton Texas labor support birth doula, Doula Resources, New Doula Ideas, Tips for Doulas. Bookmark the permalink. Watch and listen….that is one of the most important things to do. So often, we think we always need to be doing something, but in order to know what to do, we need to be able to listen to the said and unsaid cues of the mom(and dad). When you do something, watch how the mother responds and adjust accordingly. A Doula’s best tool – her calm quiet reassuring presence. And, for the love of mother’s everywhere, please put away your phone. Cultivate compassion, and observe peacefully.